Word comes from across the Pacific this morning that China has been increasing their gold reserves and finally decided to let the world know about it. 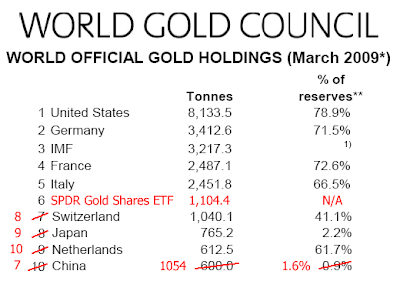 Here's the list of the world's top holders of gold, updated to reflect China's new total and the SPDR Gold ETF holdings. Hu Xiaolian, head of the State Administration of Foreign Exchange, announced the hefty increase which was attributed to domestic purchases and scrap supplies. China overtook South Africa last year as the word's leading producer of gold and, apparently, a good portion of that output is finding its way into central bank vaults, though, as a percent of total reserves, it's still just a pittance. Whats hilarious is that Western central banks who are selling gold make a big deal out of it and this helps to keep the price down. Those countries buying the stuff do it very stealthily so that the price won't go up too much.